The questions below will help you “guesstimate” your tenting needs for budgetary purposes and to make sure the required tent will fit in the space available. Answers to the first two questions are required to generate an answer. If you already have more details about your event, answer as many questions as possible to generate a more accurate tent size estimation. This form is intentionally simplistic – if there is a configuration or item not listed you would like to have under your tent, please consult with our event specialists! Please note: APR offers tents for full-service events only. To be eligible for this service, your event must be more than 30 days out and your rental order from us must contain glassware, flatware, china, linens, tables & chairs. If you are in need of just a tent, tables and chairs we are happy to recommend some other great vendors in the area. What type of seating arrangement will you employ? Will you have a buffet? Will you have a bar? Will there be a server behind the bar(s)? How many cocktail tables would you like under the tent for guests to gather around and/or set down their drinks? Will you have a dance floor? Do you need a stage under the tent? If so, what size? Will you need any of the following Accessory tables under the tent? It looks like you've missed one of the required fields: either the number of people you plan to have under the tent, or the type of seating you'd like. Go to the top and fill those in! 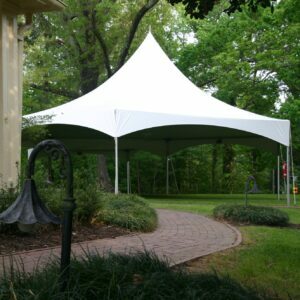 Your event will require approximately square feet of tented space. See our selection of tents by clicking here!